As a consultant, your website has different needs than other businesses. The theme you choose for your WordPress website should reflect this. Choosing the best WordPress theme for consultants will give you an effective website. The best theme on the market for consultants is X Theme by Themeco. X Theme is the perfect theme for creating effective digital marketing materials for consultants. It’s the only theme I use in my own business and for my clients. WordPress with X gives you an ultra-powerful tool that you can use to get more clients. There are three main reasons why X Theme is the best WordPress theme for consultants. X Theme is the best WordPress theme for consultants because of it’s emphasis on marketing. As a consultant, your website is your most important marketing material. It’s the centerpiece of your digital marketing system. The X Theme developers consulted with the best internet marketers while making the theme. They built X from the ground up using strategies from top digital marketers. As a consultant, this is crucial. You don’t want to use a theme that just looks fancy. You want a theme that helps you (or your designer) build effective marketing materials. X comes with over 20 plugins. Most of these plugins are what make up the components your marketing machine. …make it easier for you to grow your reach, capture user email addresses, build and strengthen your audience, and enhance your credibility. X comes with these plugins and they integrate flawlessly. This saves you the headache of having to worry about compatibility issues. The elements included with X Theme consists of strong calls-to-actions and information organization. As a consultant, your website needs clear calls-to-actions. Actions like filling out your forms or signing up to your list are measurable. They mean growth for your audience — and thus your business. You want to make sure the information on your website is well-organized. When your website is easy to read it shows that you have your reader’s best interest in mind. X makes this easy. X Theme has no fluff – it’s a lean marketing tool that will help you grow your business. Another reason why X is the best WordPress theme for consultants is that it’s easy to use and customize. If you don’t have a budget and want to get a simple website up fast – X is the perfect choice. It comes with pre-made layouts where all you need to do is insert your copy. Or you can insert templates from other designers with one click using Cornerstone. 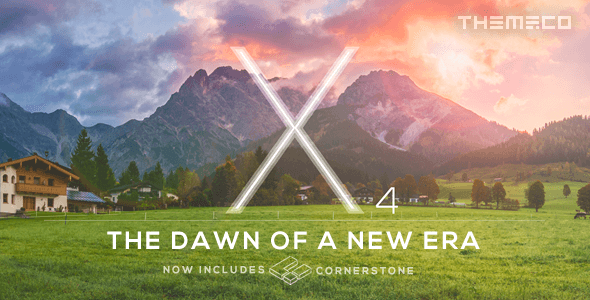 Cornerstone is the pagebuilder plugin included with X. If you can’t hire a designer or developer, I would still use X instead of something like Wix or Squarespace. It’s easy to install and use a template (like my consultant landing page), but with more flexibility. X is also amazing if you decide to hire a professional to build a website for you. It’s flexibility allows designers to customize it to fit the needs of your brand. If you use a generic theme that lacks customization you’re at risk of looking generic. This will not help you separate yourself from the rest of your field. A skilled designer/developer can use X to build you a website unique to your business and your brand. When potential clients visit your website to find out more, they will check out your website. Your website must be professional, unique, and communicate exactly what you do to capture their attention. Whether you want to do it yourself or hire a professional, X makes sense for both scenarios. X’s amazing community and support make it the best WordPress Theme for consultants. The community and support surrounding a theme will tell you how good that theme is. X has a fantastic community. Groups like X Theme Users show this. The X community is always sharing tricks, tips, and helping X users out. Members of the X community create their own unique services and products that help other members out. Take WP Speed Guru by X theme user Alexei Kutsko (who’s service I use myself). His tutorial teaches WordPress users how to speed up their website. It’s applicable to all WordPress websites, but he uses X theme for his central case study. He recommends using X if you want a fast website. Or Essentials, by founder of grooow.io, Chris Schwartze. Eseentials is an impressive library of Cornerstone templates that you can use to give your consulting website a clean, modern aesthetic — and to generate business results. X Theme’s support team is also top notch. Whether you go the DIY route or hire a designer, X support makes finding help easy. You can use their comprehensive knowledge base or support center. The developers at Themeco want to make X the best WordPress theme on the market. WordPress is becoming more popular, and X will continue to rise to the top with it. Even though X Theme is a multipurpose theme, it’s the best theme for consultants. The theme’s emphasis is on marketing, flexibility, and amazing community. X Theme gives you the tools you need to build the best digital marketing system for your consultancy. So you have chosen the perfect domain name for your consultancy. And now you know the best WordPress theme for consultants. Buy X and get started on your digital marketing machine. Then you can start expanding your reach, building your audience, strengthening your relationships, and getting more clients. NOTE: I’m not affiliated with Themeco or X Theme in any way. I recommend it based on what consultants need, the marketing problems they have, and my success using the theme.